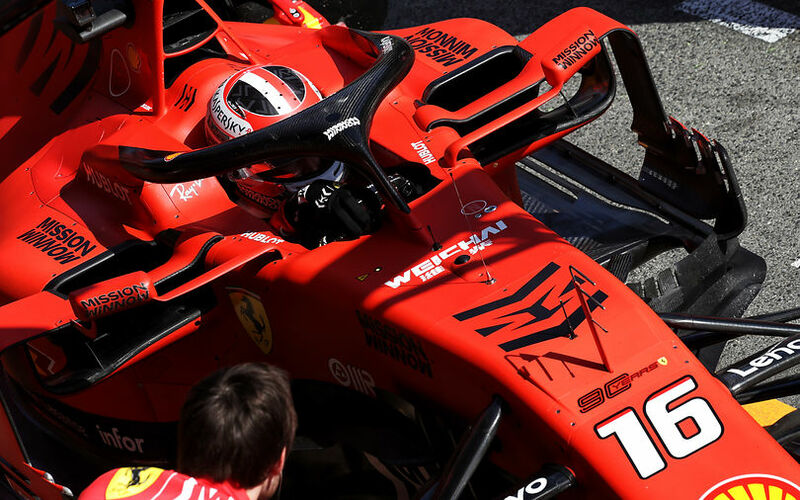 Charles Leclerc has secured his first pole position in Formula One, outqualifying his Ferrari team mate Sebastian Vettel. The result marks the 62nd Ferrari front row lockout, equalling a record jointly held by Williams and McLaren. Robert Kubica was the first man out on track, soon followed by the other Williams of Russell and Albon for Toro Rosso. Albon's first time of the session was immediately significantly faster than Russell's time, while Kubica pulled back into the pits without crossing the line. Lando Norris, who was out early as well, was on a solid lap until he got blocked by Grosjean in the final corner. His team mate at McLaren, Carlos Sainz, was better off, and moved up into fourth after Leclerc, Vettel and Bottas had taken the top three spots on the timing sheet. Hamilton was on a bit of a different run schedule, and only set his best a few minutes after the other top guns, ending up third after a scruffy lap. Magnussen, Verstappen, Grosjean, Raikkonen and Ricciardo made up the remainder of the top ten before everyone out of the provisional top 7 went out again for a final attempt to get through into Q2. In the end, the surprise elimination was Hulkenberg. The Renault driver had been on strong form in the free practice sessions, but come qualifying ended up just 17th, 2 tenths slower than what Ricciardo managed in Q1. Q2 showed a similar picture , with Leclerc once again getting the upper hand, edging out both Mercedes by half a second. Vettel's first lap though was pretty poor, ending up 6th, behind Magnussen and Verstappen, and 1.2s down on his team mate. Some traffic caught the German out, followed by a bad lockup into the sharp left hander onto the back straight. Near the end of the session, Vettel obviously went out again, improving to second, about halfway in between Leclerc and Hamilton. Raikkonen only just managed to move up into 10th, leaving Ricciardo and Gasly as the disappointed drivers. Ricciardo especially lost out by 0.017s. Q3 ended up a tricky situation for Vettel, as with just one set of fresh softs left, he chose to sit out the first half of Q3 while the others were doing a first attempt. That first attempt saw Leclerc once again go fastest, 2 tenths clear of Hamilton and 3 tenths faster than Bottas. Magnussen, Sainz, Grosjean and Norris were 4th to 7th, a perfect alteration between Haas and McLaren. Vettel was hence the first to start his flyer, and he completed it by going second fastest, 2 tenths down on his team mate's first attempt. The Monegasque actually shaved off another tenth on his second run with a new track record. Hamilton and Bottas were close to one another, but will have to settle with starts from the second row. Max Verstappen qualified 5th as he also completed just a single run in Q3.